"Canada's Castle in the Rockies"
The realization of his dream resulted in a series of lavish hotels built along the railway line. These “Castles of the North” echoed the elegant style of medieval French châteaus and European citadels, providing guests with sumptuous surroundings and unmatched hospitality. These historic hotels now operate under the Fairmont name, and have hosted kings and queens, celebrities and honored politicians. Just as King George VI and Queen Elizabeth did during their 1939 royal tour of Canada, we now invite you to take a journey to these Canadian crown jewels, and discover the roles they’ve played in Canada’s national identity and heritage. 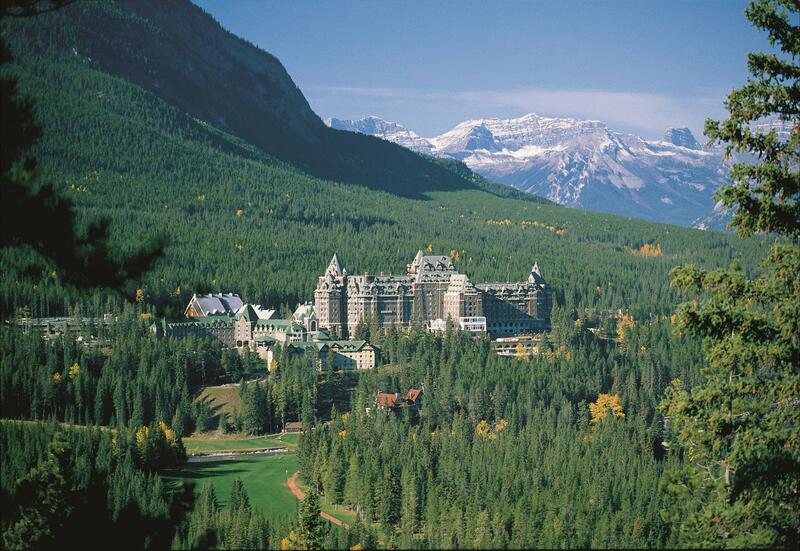 Van Horne secured acclaimed New York architect Bruce Price, father of Emily Post, to design his first grand hotel, and the Fairmont Banff Springs Hotel opened in 1888. Against its Rocky Mountain backdrop, the fairytale hotel rises from a forested bluff at the confluence of the Bow and Spray rivers in Alberta’s Banff National Park. A building error caused the original four-storey chalet to face away from the mountain. The problem was ultimately rectified, however, after the original structure burned down, and today’s grand stone castle was built in 1928 to replace it. 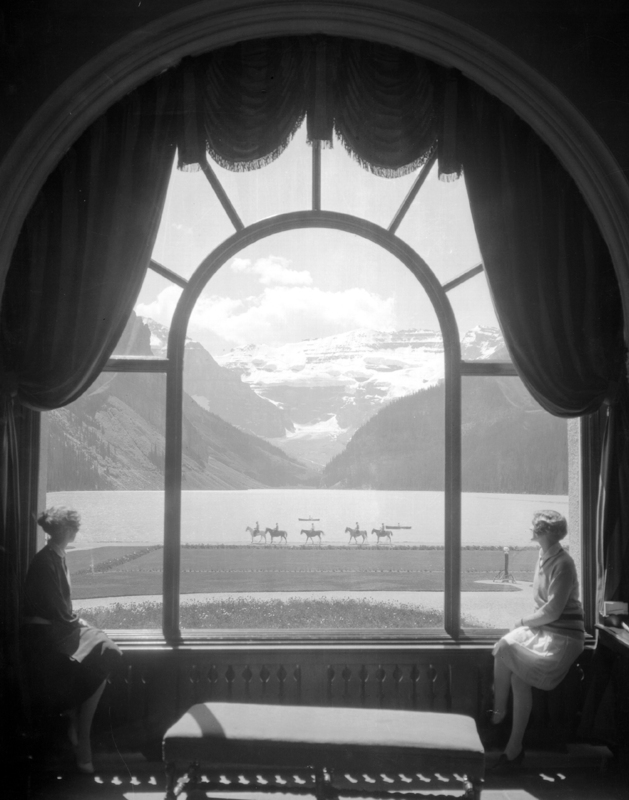 Epitomizing the golden age of travel, aristocratic guests would stay for up to a month, enjoying the wild beauty of the Canadian west in opulent surroundings. Today, guests can climb the elegant staircase of Manitoba Tyndall stone, marvel at the Alhambra Room’s ornate cast bronze doors, and take in the same sweeping Bow Valley panoramas that guests like Fred Astaire and Marilyn Monroe viewed from this National Historic Site’s lovely Cascade Ballroom. 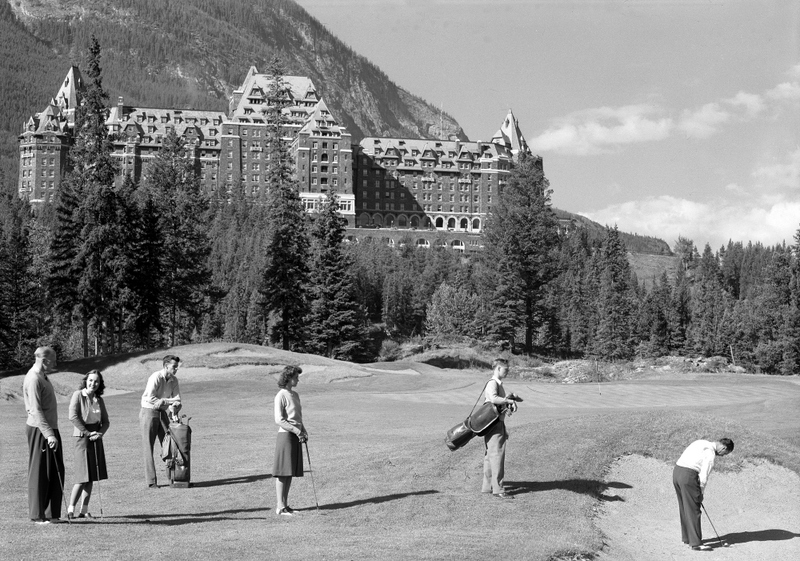 Golf has always been popular at Fairmont Banff Springs! The next stop along this historic line of railway hotels brings us to Fairmont Château Lake Louise, also in Banff National Park. When Van Horne constructed the original one-storey chalet in 1890, he envisioned “a hotel for the adventurer and alpinist,” and so it is. Nestled between soaring peaks and Lake Louise’s gleaming turquoise waters, this beautiful hotel stands in the celebrated birthplace of Canadian mountaineering. Upon opening, CPR hired professional Swiss mountain guides to lead guests in more than 250 summit ascents. The hotel closed during World War II, as so many did. But scientists used ice from the frozen lake to develop Pykrete, a composite material Winston Churchill and the Joint Chiefs of Staff seriously considered using in an Allied invasion through Northern Europe, but later decided against. Château Lake Louise and Banff Springs Hotel were initially summer-only resorts, but starting in the 1970s, they remained open for winter sports enthusiasts. A decade later, the 1988 Calgary Winter Olympics showcased Banff National Park’s ski resorts to the world, and today the hotel is a favoured spot for the international ski circuit. Situated within the walls of Old Québec, Fairmont Le Château Frontenac overlooks the city and St. Lawrence River. Van Horne once again sought the talents of Price, who created the soaring spires, towers and turrets of this castle in 1893. The hotel site is where the “Father of New France” Samuel de Champlain built a fort to protect his new settlement in 1608. 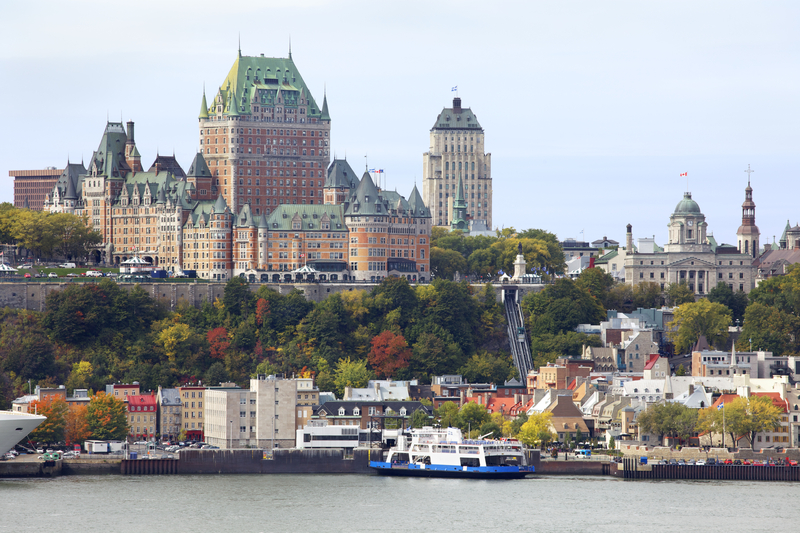 It’s also where the hotel’s namesake, flamboyant French governor Louis de Buade, Count of Frontenac, directed New France’s destiny from 1672 to 1698. Frontenac’s coat of arms graces the hotel’s entry arch, and inside, historic remnants from the site’s 400-year history are on display. Slivers of glass sparkle in a 226.8-kg (500-lb) custom chandelier inspired by the icicles formed during Québec’s winters. During World War II, world leaders stayed at the hotel to meet and discuss strategy, and it was here in April 1943 that Winston Churchill was introduced to the aforementioned Pykrete. Admiral Lord Louis Mountbatten dropped a chunk of it into a surprised Churchill’s bathtub (with Churchill bathing inside!). Built in 1908, the Fairmont Empress adorns the head of Victoria’s sparkling Inner Harbour. The magnificent Edwardian-era hotel includes contemporary elements, displaying the first transition away from CPR’s strictly château-style hotels. Within this National Historic Site’s ivy-covered walls, Prince Edward waltzed until daybreak beneath the 8,000-piece, hand-strung crystal chandeliers of the Crystal Ballroom. When the adjacent Palm Court was restored to its formal elegance in 1989, its original stained glass roof was discovered hidden behind wood. It was beneath this glittering dome that ladies enjoyed Afternoon Tea, gossiping behind their wide, exquisite teacups expressly designed for this purpose. Approaching Fairmont Empress in Victoria's Inner Harbour. Eventually, the ladies insisted that Afternoon Tea be moved to the Grand Lounge (now the Lobby Lounge) when they learned the acoustics of the graceful Palm Court rotunda caused whispered gossip to be easily heard in other parts of the room. Today’s Tea at the Empress is served on the exclusive china used in 1939 during the royal visit of King George VI and Queen Elizabeth. Charles Melville Hays, general manager of the Grand Trunk Pacific Railway of Canada shared Van Horne’s dream of building luxurious hotels along the new transcontinental railway routes. 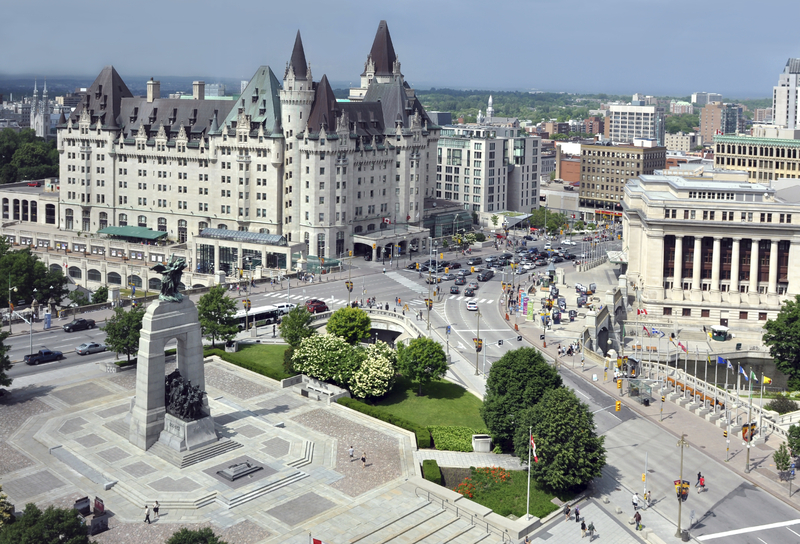 He chose a picturesque setting beside Ottawa’s Rideau Canal for the regal Fairmont Château Laurier. Unfortunately, Hays was lost aboard the ill-fated RMS Titanic and never saw his dream realized. The hotel's grand opening on June 1, 1912 was attended by its namesake, Canada’s seventh Prime Minister Sir Wilfrid Laurier. Designed by Ross and MacFarlane, the national historic site is decorated with Neo-Gothic lines like those of is neighbouring Parliament buildings. In fact, the hotel is often called “the third chamber of Parliament” because of the numerous politicians found traversing its corridors. “Ottawa’s Castle” lobby features its original oak paneling, marble floors and Tiffany glass windows. Design enthusiasts appreciate the sculpted ceiling of the Adam Room, named in honor of British architect Robert Adam who made the room’s oval shape famous in the late 18th century. Fifteen Yousuf Karsh portraits grace the walls of the Reading Lounge and Karsh Suite – gifts from famed photographer Karsh and his wife Estrellita who lived in and worked from the hotel for 18 years. Built by CPR on the site of the former Queen’s Hotel in 1929, The Royal York Hotel dramatically altered downtown Toronto’s skyline, its 28 storeys making it the largest hotel in the British Commonwealth. The palatial hotel’s guestrooms featured radios, private showers and bathtubs. Also within its walls were a 12-bed hospital, 12,000-book library, 10 ornate passenger elevators, and a concert hall with a 50-ton pipe organ. 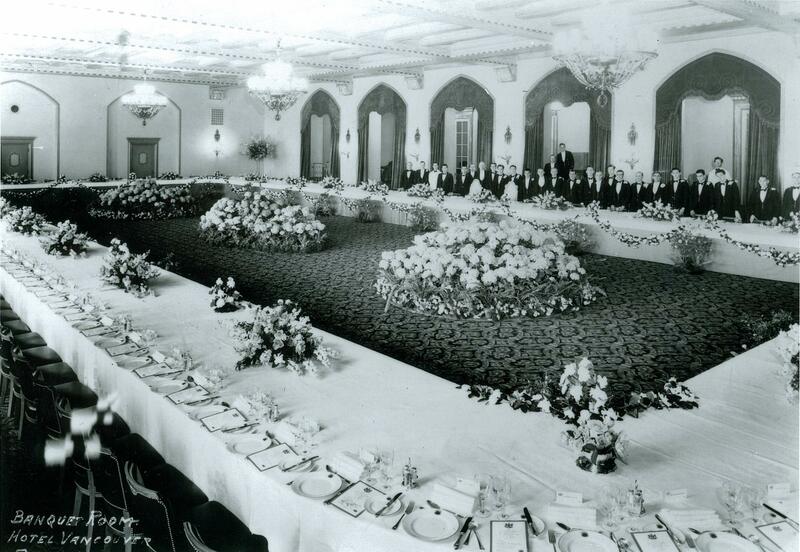 The hotel also held the largest hotel kitchen in Canada, a designation that remains intact today. Known as a “city within a city,” a marble-clad tunnel leads from Union Station to a basement arcade of shops and businesses. Inside the Fairmont Royal York, the ballroom’s hand-painted ceilings, walls, and glittering chandeliers retain their original splendor, unaltered since their 1929 debut. 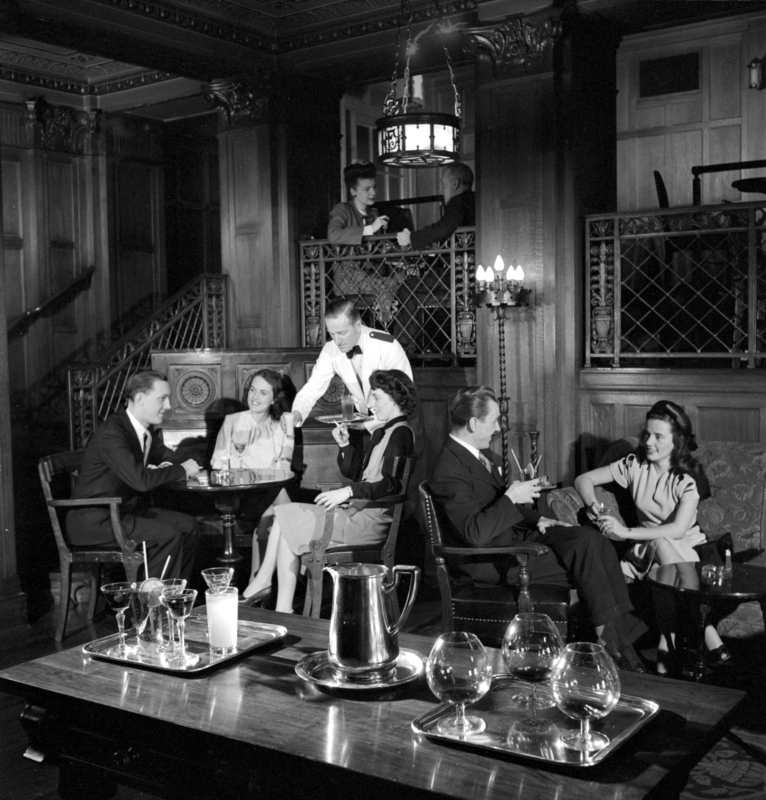 From its earliest days, the hotel’s Imperial Room welcomed guests for dinner and cocktails, and to hear performers such as Ella Fitzgerald, Duke Ellington and Peggy Lee. The Imperial Room’s meticulously restored dressing room is one of Canada’s true historical treasures. The final stop on this historic journey brings us to the stately Fairmont Hotel Vancouver. The present-day Hotel Vancouver is the third structure to hold the name, its heritage dating back to 1888. 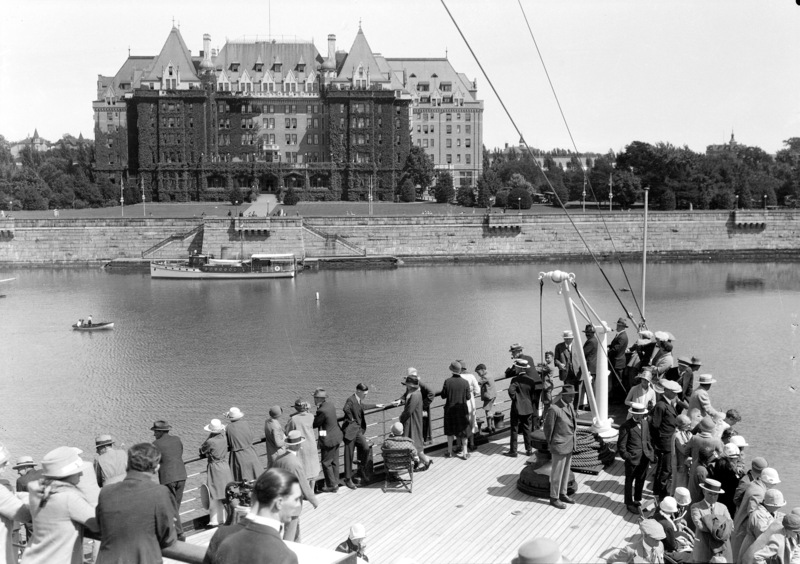 Construction of today’s hotel was initiated by the Canadian National Railway, but was ultimately completed by CPR in 1939. Its doors opened on the eve of King George VI and Queen Elizabeth’s royal visit. The 17-storey hotel façade contains many of CPR’s traditional château-style features, as well as carvings of mythical flying horses, gargoyles and griffins, symbolic protectors of travellers. The recent lobby and restaurant renovations were inspired by the romance of rail travel with a central allee, designer boutiques and a lobby lounge with intimate dining compartments, decorative grillwork, and period details. A lower level speakeasy venue is punctuated with tin ceilings and cozy nooks, recalling the rum-running of Vancouver’s heyday. And while many of the historic Fairmont hotels are the subject of debate over their ghostly tales, Fairmont Hotel Vancouver celebrates their resident ghost. Long-deceased resident Jennie Pearl Fox is considered one of the nicest ghosts in the city, with the hotel even naming a cocktail after their famous "Lady in Red." From dramatic wilderness settings, to exciting urban centres, each of these Fairmont hotels is a historic landmark, architectural treasure, and living legacy of Canadian railway history. Are you planning a visit to Fairmont's historic hotels this summer? Book our Moments Offer and enjoy up to 30% off.